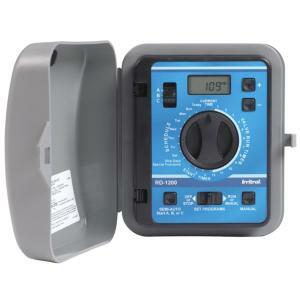 The modular design and versatility of the RainDial-R irrigation controller makes it a top choice for both homeowners and contractors. The convenience of the indoor model with external "plug-in" transformer makes installation so easy. Programmable from your armchair makes it even more desirable. Modular programming requires the installation of one 9V alkaline battery (not included). In addition, pairing it with the optional Climate Logic® Wireless Weather Sensing System turns it into a "smart" controller, making water management a breeze. When using with Climate Logic the Rain Dial-R will automatically adjust the watering schedule according to the weather. This helps maintain a healthier landscape and reduces water consumption and cost.